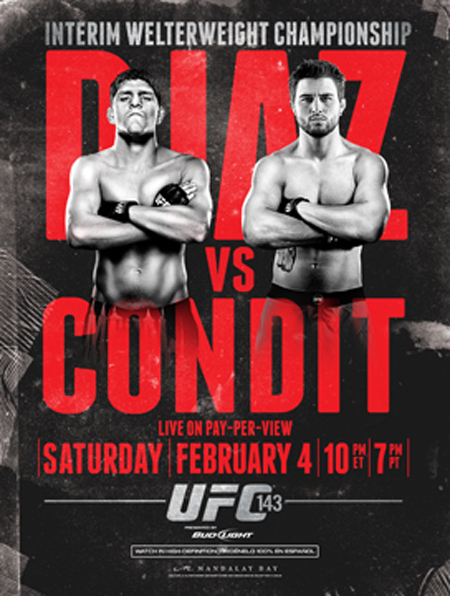 It wasn’t the fight that was initially scheduled to headline UFC 143, but the shootout between Nick Diaz and Carlos Condit could prove to be even more exciting. In anticipation of the interim welterweight title bout, the planet’s premier mixed martial arts promotion has released the official event poster for the February 4th event. Champion Georges St-Pierre was pegged to defend his throne against Diaz, but a knee injury forced GSP out of his second consecutive fight. Although they aren’t depicted in the billboard above, a 170-pound match with Josh Koscheck and Mike Pierce is slated as the card’s co-featured contest. The Mandalay Bay Events Center in Las Vegas, Nevada hosts the festivities. The pay-per-view broadcast begins live at 10PM ET/7PM PT.